Height lengthening, also referred to as limb lengthening, is a modern procedure that has been introduced and conducted with a high success rate for the last 50 years. The minimally invasive surgical procedure involves a surgical cut in the leg and/or thigh bones and promotes the lengthening and mending of any deformities in the leg. It was originally conceptualized in the 1950's by a Russian surgeon named Gavril Illizarov, and its techniques have been significantly advanced since. These advancements result in less complications and faster recovery time. 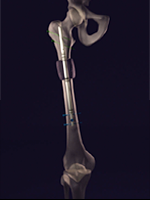 The height lengthening and deformity correction techniques may be implemented to replace missing bone and to lengthen or straighten deformed bone segments. Adults and children may benefit from the procedure if they have deformities due to birth defects, injuries, or diseases, specifically patients who are bow-legged, have one leg shorter than the other, suffer from knock-knee deformities, or injuries and trauma. The process of lengthening the bones and correcting deformities works when gradually growing new bone and soft tissues through a method call distraction osteogenesis. Once there is a surgical incision made, the bone is pulled apart at a very slow rate of approximately 1 mm per day until the length desired is reached. A segment of the bone can be lengthened by 4 inches, this will typically be determined by the body's anatomy. The new bone grown is strong, natural and will not wear out. It is a minimally invasive procedure and will typically require only 1 or 2 evenings in the hospital. Patients experience little pain since the growth is progressive and they can walk independently with crutches during the process. There are a variety of limb lengthening techniques available. The devices used can be external, internal, or both. Children and adults are candidates for the treatment. Children with congenial deformities may often be experiencing different lengths of the legs. Adults who do not address this may suffer from hip arthritis and/or back pain. After a fracture, bones might shorten and may become deformed (malunion). In some cases bones may not heal (nonunion). Limb lengthening procedures address these issues. Our procedures have successfully corrected extreme deformities and have equalized limbs with differences of several inches. Some patients suffer from a segment of bone missing after a bone tumor, infection, or severe fracture. Our procedure can transport new bone to fill in these defects. Patients of short stature, otherwise known as Dwarfism or achondroplasia, may benefit from limb lengthening procedures. Our procedures can lengthen both legs of patients in order to help patients grow taller. Achondroplastic dwarfs are especially permissive to limb lengthening because of their intrinsic anatomy. Limbs of these patients have been lengthened up to 12 inches in legs and 5 inches in the arms. These patients benefit because they can reach the telephone, toilets, gas pedals and harder to reach items. Allowing them to be functionally independent. Patients who are young adults and suffer from deformities such as being bow-legged or have a knock-knee deformity are at risk for developing arthritis due to their improper anatomical alignment. The techniques we use safely correct severe deformities and help you avoid the need for early joint replacement. These procedures are used to give opportunities for all individuals who are looking to enrich their lives and approach day-to-day activities with ease. Call us at 310-985-6900 for more info or contact a height lengthening doctor today.